Sheet Pan Chocolate Cake is far from a new invention but I love this stuff. I made this pan for a church event a few weekends ago. I had no idea how many people would be there so I liked the flexibility of a big pan, to slice big or small depending on the numbers (as opposed to strictly portioned cupcakes, my usual cake choice!) This Texas Sheet Cake recipe comes from my mom and there's a few things I love about it. It's cheap and easy to make- and tasty of course! The chocolate color and flavor is more intense than most similar cakes I've tried because the cocoa is boiled with the liquid before you bake it. It's a quick step that makes all the difference. The frosting is also boiled for the same effect. Stir in a few marshmallows (and nuts if you like) right when the cake comes out of the oven and ice it immediately. The end product is a beautiful, easy to make cake that tastes amazing. It's far from health food but great for a party (just make sure you send guests home with any extra slices or you'll be in trouble!) Serve it with ice cream for an even more decadent, but totally comforting treat. One last thing, before I go make my dinner (My tall man cannot live on dessert alone unfortunately!) I'm sure you heard, but just in case, today only you can get a $20 Amazon Giftcard for only $10 from Living Social. Oh man. We've snapped a few up already because you can buy pretty much everything from Amazon (think of the Mixers, Silpats, Gadgets, Baking Sheets, even TVs- that one's on my husband's wish list of course!) You can even use it for diapers (not as fun but it's pretty great to have them come straight to the door!) I've bought a few things from Living Social and haven't been disappointed. If you buy a gift card please let me know what fun things you get! And wish me luck, that my card gets spent in the "Home and Garden" (my favorite department)- not "Electronics!" When everything is nice and mixed, turn the mixer on low and slowly pour in the boiled chocolate. Stir until just combined and pour into ungreased half sheet pan (a regular cookie sheet or jelly roll pan, as show above). Bake at 350 for about 20 minutes, until the cake looks set and springs back slightly when you touch it. Meanwhile, prepare the frosting. Add in the following ingredients and whisk until nice and smooth. Set frosting aside and pour over cake as soon as it comes out of the oven. Spread it gently to cover the whole cake and let set for a few minutes. Garnish with additional nuts if desired. This cake keeps well for a couple of days, just keep it well covered. It doesn't ever last at our house long enough to go bad, though! This cake never disappoints. I will try your recipe for my mothers 83rd birthday next week. With 39 grandkids I shouldn't have to worry about leftovers. 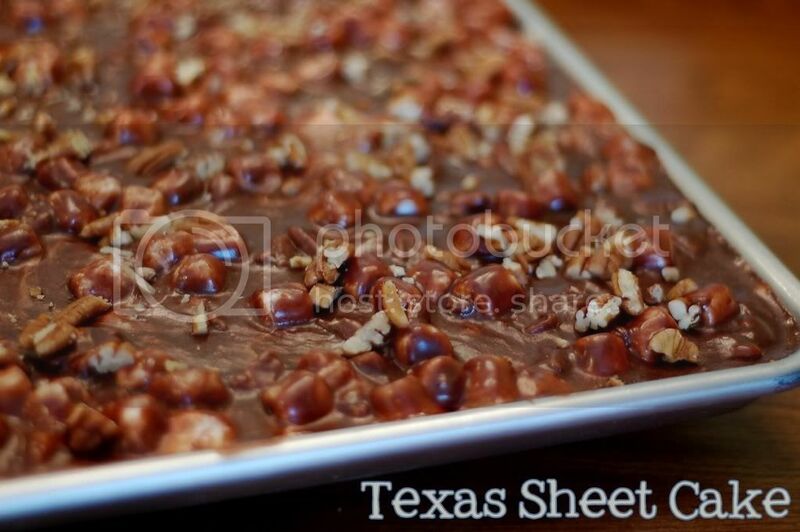 Hands down best Texas Sheet Cake! Glad you posted it. The buttermilk adds just the right twang (is that a word) to the cake. Don't wait for the marshmellows to melt. Top the cake immediately and they will make beautiful swirls all over or tasty little melt in your mouth bits of goo! Mmm...I can't wait to make this. I love desserts like this because you don't have to worry that there won't be enough. Your sheet cake sounds extremely delicious especially with that fantastic frosting you put on top of it. By the way, I'm starting a new linky on my blog this Saturday called "Sweets for a Saturday." I'd like to invite you to come by then and link this up. That looks divine...especially that pecan frosting. I love Texas sheet cake, although I've yet to get my grandmother's recipe out of my mom. So far the Pioneer Woman's recipe has been a good substitute, but I'd love to try your version next time I'm baking for a crowd. Yum! I love Texas Sheet Cake. I've seen many out there, but this one looks (and the recipe) like the one my mom used to make. Yu-um! my mom's tsc is the best i have ever had, i have had some bad ones too. this recipe looks the same other than the frosting i think. i am sure it is great! love all you do! and trying to get to the wedding too!!! This cake looks and sounds positively wonderful! Ali featured us both over at Jam Hands and I'm so glad that she sent me your way! DO NOT put frosting on directly out of the oven...Let cool first.